Last week we were met with more “normal” weather conditions, as if you can call anything associated with this spring normal, just a couple of days ago we woke up to temps that just barely broke into the 40’s and the days high that only flirted with 60. The week overall was good, fishing is beginning to get to where it should be. Water temps are steady into the mid 60’s, with some bays inching towards 70. With water temps heading north weed growth is going to be taking off as well and as weeds grow, so does the fishing. Fish like the added oxygen and congregate near the vegetation, big fish eat the small fish and I eat the big fish, if you catch my drift. Pictured below from L to R: Klint Carlson from Waverly, IA and his girlfriend Kiley, Mike Geilow from Apple Valley, MN, Austin Patton and his wife Kara, from Cedar Rapids, IA – I’d be smiling too, those are some beauties! As water temps rise the availability of spot-tail shiners tends to end and end fast, forcing anglers to dip into their bag of tricks to continue their hunt for Walleye. This time of year that bag of tricks is usually of the creepy crawly variety. leeches and night crawlers will adorn many hooks over the next few weeks, either tied onto spinner rigs or bare snells, pulled to the bottom with slip sinkers and bottom bouncers. Some may even choose to rig up a slip bobber and kick up their feet and wait. 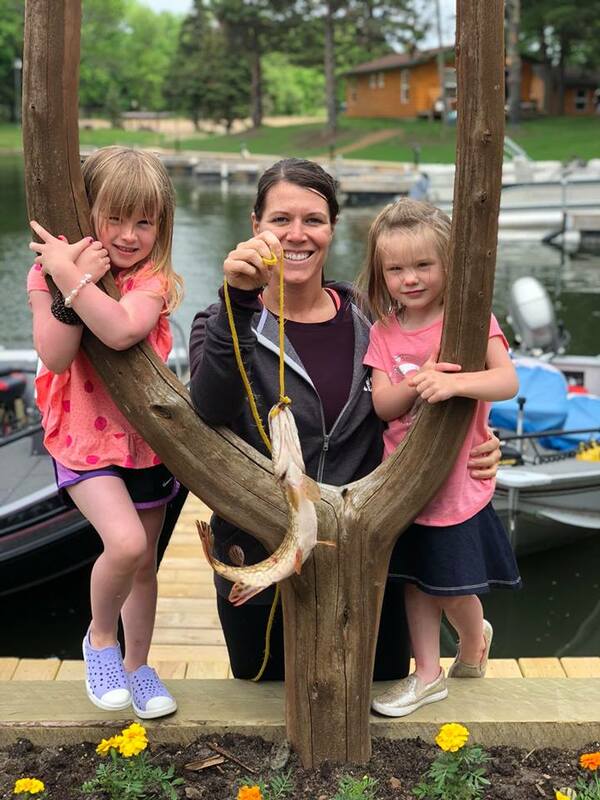 Pictured below from L to R: Lori Carlson from Waverly, IA with her son-in-law Mike and Scot Bowman from New Hope, MN with a nice variety pack of perch and sunfish. This past weekend was the 10th annual Leech Lake Walleye Tournament, 155 boats braved some of the harshest conditions I have seen in a long time. Anglers were greeted with frosty temperatures in the low 40’s Saturday morning and a pleasant breeze out of the South East that made the lake look more white than blue. Sunday was more of the same, though this time the wind shifted and blew North West at up to 30+ mph, making the journey from Walker Bay to the main lake a treacherous one, I wouldn’t doubt there were 5 foot rollers out there that day. The Champions for the 2 day tourney brought in an impressive catch of over 33 pounds for 12 fish and with the conditions they had to battle, is very impressive. Big fish for the tourney was 7.7lbs, I’m curious to know the length on that fish, for this time of year that thing must have been over 30″. We’re getting ready to head into our busy summer season here in the Walker area, soon the streets, stores and resorts will be flooded with kids, parents and friends. If you’re looking for a vacation spot this summer the Walker area will not disappoint, for more info head over to our local chamber of commerce website at http://leech-lake.com/ or give them a call at (800)833-1118 they will answer any question you might have!